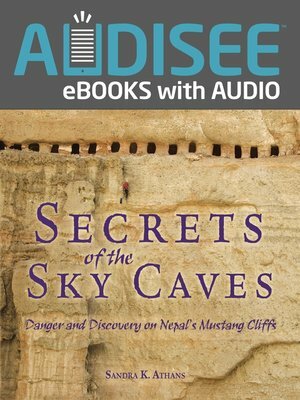 Audisee® eBooks with Audio combine professional narration and sentence highlighting to engage reluctant readers! What's more dangerous than scaling Mount Everest? For mountaineer Pete Athans, the answer lies in the ancient kingdom of Mustang, a remote part of the Asian nation of Nepal. Long-abandoned caves built high into steep cliffs contain amazing treasures—and pose incredible dangers. Reaching these "sky caves" safely takes guts, smarts, and luck. And then there's the question of what to do with a two-thousand-year-old human skull. . .
From 2007 to 2012, Pete explored Mustang's sky caves with a team that included scientists, mountain climbers, and even two children. They found mummies, murals, manuscripts, and other priceless artifacts. Follow Pete on his dangerous trips to the sky caves and discover the secrets the caves revealed.